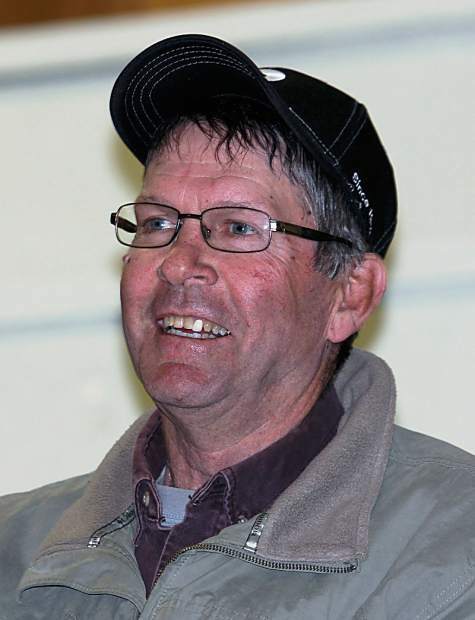 Dorwin Howe has purchased Evenson Angus bulls for many, many years. 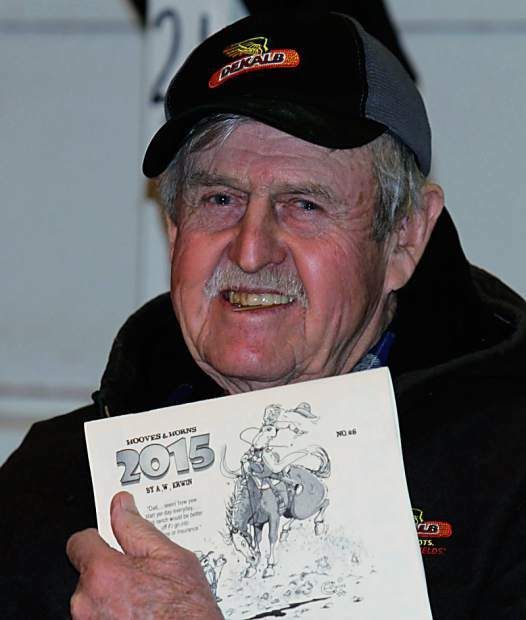 Bill Penfield, Lemmon, S.D., Evenson Angus bull buyer. 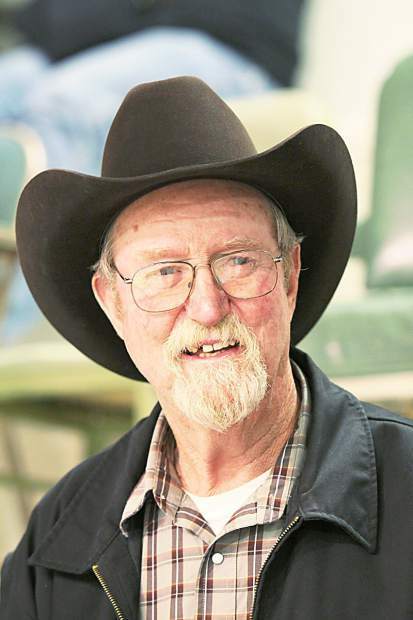 Ralph Tripp has been using Evenson Angus bulls on his Gillette, Wyoming, ranch for many years. 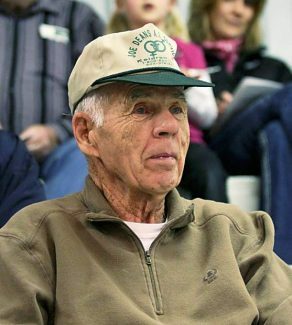 Charley Verlhust, Reva, S.D., longtime repeat Evenson Angus bull buyer. Evenson Angus, Hettinger, N.D., held their 35th annual Production sale at Lemmon Livestock Auction on Mar. 19, 2015. Bill and Eleanora Evenson, Trevor and Carrie Strand along with Wally and Rodney Evenson welcomed a very nice crowd of buyers that braved the cold, windy weather to come to town for the sale. This was an excellent set of bulls for their 35th annual sale. If your looking for bulls with a little more frame, but full of natural thickness, muscling, and fleshing ability, this is the place to find them. There was also a great selection of calving ease bulls that were highly fought after buy the bidders, giving Evenson Angus one of there best sales to date. Topping the sale to long time repeat buyer, Dorwin Howe, Hettinger, N.D., was lot 444, Evenson Upward 444, a Feb. 15, 2014 son of Sitz Upward 307R that had a 205 day wt. of 823 pounds, yearling wt. of 1,476 pounds, and epds of CED 4 BW 2.5 WW 69 Milk 32 YW 125. $14,500 was the price when the gavel came down. Other top yearling old bulls were lot 485, Evenson Upward 485, a Feb. 26, 2014, son of Sitz Upward with epds of CED 7 BW 1.4 WW 67 Milk 34 YW 114. This bull weaned off at 823 pounds, and had a 365-day wt. of 1,436. Nick Nehl, Watauga, S.D., was the buyer at $10,000. Lot 434, Evenson Ten X 434, a Feb. 10, 2014 son of AAR Ten X 7008SA sold to Price Ranch, Buffalo, South Dakota, for $10,000. This bull had a 205 day wt. of 767 pounds, 356 day wt. of 1,309 pounds, and epds of CED 10 BW .4 WW 61 Milk 23 YW 111. Topping the eighteen-month-old bulls was lot 3514, Evenson Upward 3514, an Aug. 9, 2013 son of Sitz Upward that had a weaning wt. of 740 pounds, and epds of CED 5 BW 2.0 WW 70 Milk 33 YW 121. Ronald Wetz, Red Owl, S.D., was the buyer at $10,000. Also selling at $10,000 was lot 3425, Evenson Upward 3525, an Aug. 13, 2013 son of Sitz Upward with epds of CED 3 BW 2.9 WW 62 Milk 27 YW 114. Eagle Nest Ranch, Lodgepole, S.D., was the buyer. Chris Veal, Veal Black Angus, Meadow, S.D., got lot 3524, Evenson Upward 3524, an Aug. 13, 2013 son of Sitz Upward at $9,750. This bull had a weaning wt. of 747 pounds and epds of CED 3 WW 62 Milk 27 YW 114.